John Fahey was an influential American acoustic guitarist. John Fahey had recorded and self-released his debut album Blind Joe Death in 1959. It had been put out under his own Takoma Records label, and in the early 60s Takoma became an actual formal business when Fahey tracked down blues singer Bukka White, and with friend Ed Denson produced White's first new recordings in over 23 years. The Bukka White album became the first non-Fahey release on the Takoma label. Fahey released his own second album in 1963, and unlike with his debut he managed to get it distributed nationally. As a result he sold many more copies and it reached a much wider audience. It actually outsold the Bukka White album. It continued what his first album had started, further refining his unique style of acoustic guitar playing with a collection of twelve mostly solo compositions (one track featured flute played by Nancy McLean). 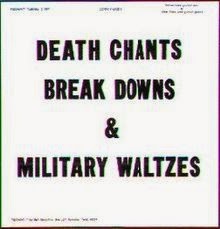 Like with his first album, Fahey ended up re-recording much of Death Chants in 1967 (all but two of the songs on the 1967 edition were re-recordings). I have got both versions here for you.